A two-step system designed to complement the METRIN Skincare System by providing the skin with more intensive exfoliation and additional moisture and nutrients. The Accelerated Performance System helps to accelerate your skin’s surface cell turnover to efficiently brighten your complexion. The Revitalizing Glycolic Complex removes dull surface cells and helps stimulate collagen production, revealing smoother, plumper skin. The Reactivating Gel then provides nutrients and hydration for your skin and helps restore its natural protective barrier. Complementing the METRIN Skincare System, the Accelerated Performance System will help to smooth wrinkles and uneven skin tone, accelerate the healing of brown spots and acne scars, and brighten up your complexion for a radiant glow. The Accelerated Performance System is safe and effective for men and women of most ages, skin types, and skin concerns. It is scented with Chamomile essential oil. We recommend using the Accelerated Performance System after your skin has adjusted to the Skincare System. Do a test patch on your skin prior to using the product. Do not use on broken skin. Please note: this product may cause photosensitivity (do not use in sun). The Accelerated Performance System contains two step: Revitalizing Glycolic Complex and Reactivating Gel. It is only available in one size. 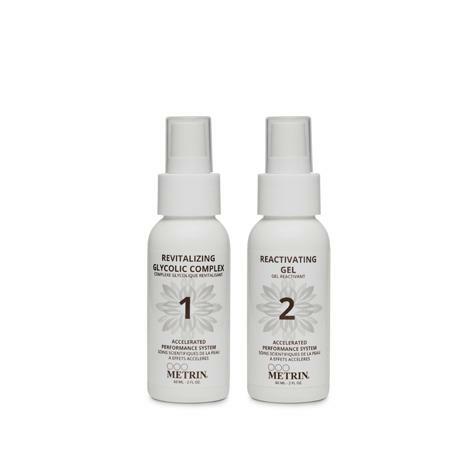 The Revitalizing Glycolic Complex can be used up to 3 times per week. The Reactivating Gel can be used as frequently as desired. Stimulate collagen production by removing dead skin cells from the skin’s surface and aiding the skin’s renewal process. Restores the natural protective barrier function of the skin by providing the skin with nutrients and hydration. The Accelerated Performance system was designed to complement the METRIN Skincare System. To achieve desired results, apply the first two steps of the Skincare System, then follow with the Revitalizing Glycolic Complex at night. In the morning, apply the first two steps of the Skincare System, follow with the Reactivating Gel, then complete the last three steps of the Skincare System. Aqua, Glycerol Monostearate, Glycolic Acid, Decyl Oleate, Octyl Dodecanol, Glyceryl Stearate, PEG 100 Stearate, Propylene Glycol, Cetearyl Alcohol, Ceteareth 20, Phenoxyethanol, Xanthan Gum, Magnesium Aluminium Silicate, Panthenol, Triethanolamine, Allantoin, Aloe Barbadensis, Tocopheryl Acetate, Methylparaben, Ethylparaben, Propylparaben, Butylparaben, Isobutylparaben, Retinyl Palmitate, Chamaemelum N.
Aqua, Glycerin, Hydroxycellulose, Diazolidinyl Urea, Allantoin, Panthenol, Aloe Barbadensis, Methylparaben, Polysorbate 20, Propylparaben, Althea Officinalis Extract, Arnica Cordifolia (Arnica) Extract, Articum Lappa Extract, Symphytum Officinale Leaf Extract, Humulus Lupulus Extract, Equisetum Arvense Extract, Laminaria Digitata Extract, Tilia Cordata Flower Extract, Achillea Millefolium, Chamaemelum Nobile Oil.